Hopefully, we’ve survived the last of the snow this year, so keep it warm, Frisco, with live music, theater, basketball, an art exhibition, and more. Check out all the fun things to do this weekend in Frisco! FC Dallas hosts San Jose Earthquakes in the 2015 Home Opener. FC Dallas are coming off a successful season and look to start 2015 with a bang. The home opener is always one of the highlights of the season, and don’t forget parking is free! Click the image to the left (or above on your mobile device) for an exclusive discount for Lifestyle Frisco readers. Contact us to have your business featured in the Weekend RoundUp. “Stitchers Book Club” – In Frisco Library, 5th Floor – City Room, from 7-8:30pm, join this group to discuss books and work on your needlework projects. “Cavalia’s “Odysseo”– THIS IS THE LAST WEEKEND! Matinee and evening performances through Sunday, March 8, under the White Big Top at Dr Pepper Ballpark in Frisco. Tickets available at www.cavalia.net or by calling 1-866-999-8111. $29.50 to $229.50 + applicable taxes and fees. Special pricing and packages available for groups, children (2-12), juniors (13-17) and seniors (65+). “Super Friday Fun Nights” – From the popular Super Summer Fun Days summer camp, comes a new, but familiar program on Friday nights. Super Friday Fun Nights is a structured evening of swimming, games, pizza and fun! Kids will swim in the Indoor Aquatic Center (Outdoor Aquatic Center during summer hours), and escape to the ‘Zone’ for air hockey, ping pong foosball and more. We end the night with fun and active cooperative games in our studios and gym! 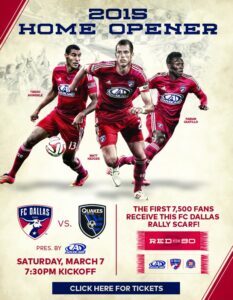 “FC Dallas vs San Jose Earthquakes” Match starts at 7:30 PM in Toyota Stadium. “Museum Of The American Railroad Walking Tour” – Join knowledgeable staff presenting entertaining and informative tours, providing a historical and technical perspective of key pieces in the Museum’s rolling stock collection. Spring Break tours will take place each Thursday & Saturday March 7 – 14 at 11:00am and 1:00pm starting at the Frisco Heritage Museum, 6455 Page Street. All walking tours are weather permitting. Please call in advance of your desired tour time during inclement weather periods. Cancellations are also posted on the Museum’s FaceBook page. Walking tour admission: $7 Adults / $3 Children ages 3-12. Please pay admission at the Frisco Heritage Museum prior to your tour. Parking and tour orientation takes place in front of the Frisco Science Discover Center/ Frisco Arts building (8004 Dallas Parkway, #200). For more info or to reserve a spot for your group, call 214-428-0101. “Massage Envy Spa Massages at IKEA” – IKEA has hired Massage Envy Spa to provide complimentary chair massages from 1-3 p.m. Two licensed massage therapists will be on-site each hour. At 7171 IKEA Drive, this event is part of IKEA’s fourth annual BYOF (Bring Your Own Friends) Day, a national in-store shopping event that offers IKEA fans and their friends a special shopping experience which includes exclusive deals, in-store activities, giveaways and lots of fun. “Board Game Club” – In Frisco Library, 4th Floor, McCallum Room, from 2-4pm, play board games with other gamers. Bring your own or play one of ours. This is a great way to learn and develop strategic and divergent thinking skills and connect with others who love games. “Spring Break Safety Education Classes at Frisco Fire Safety Town” – Spring Break Safety Education Classes at Frisco Fire Safety Town will be offered daily at 10:00 AM and 2:00 PM. A variety of classes designed for children already in Kinder through fifth grades will be available. They are open to the public and free of charge. Classes include bike time in the village. Children are encouraged to wear closed toe shoes for safety during bike riding. Registration available our website: www.FriscoFire.com. For those wishing to schedule a tour please call Safety Town at 972.292.6351. “Sleeping Beauty” Spring Break Drama Camp” – Squee Productions is proud to announce a spring break drama camp taking place at the Frisco Discovery Center! Students, ages 7-18 years old, will explore the classic story of Aurora (Sleeping Beauty) in a whole new way. The show will be a darker, more gothic presentation of the original Disney version of the tale. Times: 10AM-2PM, M-F, with a matinee performance at 2PM on Friday. Cost: $125 for the week. “Citizens Emergency Response Team (CERT) classes” – Our annual Citizens Emergency Response Team (CERT) classes begin March 9, 2015 and occur on Monday evenings from 7:00 -10:00 p.m. It will culminate in a mock drill on a Saturday morning May 2, 2015. The course is an all-risk, all hazard training program which instructs citizens about disaster preparedness. Attendees learn how to respond to a disaster or other large scale emergency situation within their community should their help be needed. Classes are held at Frisco Central Fire Station. Applications available at any fire station, online at www.FriscoFire.com or by email at education@friscofire.com. “Get Frozen” Spring Break Camps – Bricks 4 Kidz is offering two options for spring break camp this year for boys and girls, themed around the popular “Frozen” movie. Build a horse, sleigh, skier, castle, etc., and have the last bit of winter fun with “Frozen” activities! Choose one or more “Get Frozen” day camps for $50 per camper, from 10AM-3PM, Monday, Tuesday, Wednesday, or Thursday. Alternatively, choose an afternoon “Get Frozen” camp for all four days, M-Th, from 1-4PM, for $120 per camper. If you have questions, please call 214-784-0687 or send an email to: lgrierson@bricks4kidz.com. “UnDead and UnRead Book Club” – In Frisco Library, 5th Floor – City Room, from 7-8pm, join the UnDead and UnRead book club to discuss and explore Science Fiction and Fantasy books. “Texas Legends vs. Reno Bighorns”– Tipoff at 7pm in Dr. Pepper Arena. AND, your Texas Legends have partnered with Dickey’s Barbecue Pit to bring you the “Four-Point Play” package, available to Legends fans for all Sunday – Thursday home games. For $40, fans receive 4 tickets to the Legends game and 4 Quarter Plate meal vouchers for Dickey’s Frisco-Warren, Frisco-Preston, and Frisco-Fieldhouse USA locations, along with 4 Legends t-shirts. Take advantage of this great offer tonight! “Paddy Dash 2015” – In this our 7th year, we welcome you to join us on March 14th in Frisco Square for an event like none other. We do not just put on a 5k run, we promote an event that the whole family can participate in. Be it a challenging sanctioned 5k route, our 1 mile fun run/walk, the free Piddy Pat 50 yard dash for kids 10 and under and our expo area with bounce houses, vendors, music, and free food and drinks! “Arts in the Square 2015” – On March 28-29, feast your eyes on incredible art, sit and relax by Simpson Plaza, listen to local musicians, watch ongoing performing arts, enjoy interactive art activities, and treat yourself to the food and spirits available at the variety of award-winning restaurants on site. Thank you for mentioning our book and board game clubs! Don’t forget — we will offer a wide variety of free spring break events for elementary kiddos and teens all week long. Check our calender to see what’s going on!